Kakegawa, Shizuoka prefecture, Japan, is an unassuming place. To get there, you take an hour-and-a half bullet train from Tokyo that passes by a usually cloud-covered Mount Fuji and which covers roughly the distance of London to Sheffield. A small city just shy of the southern coast of the country, its main draw is a 15th century castle seemingly air-dropped into its middle. When I visit in October, wandering past petrol stations and 7-11s and wedding parties streaming out of business hotels, it strikes me as the kind of sleepy town possessing the perfect conditions for teenage obsessions to foster. Not least for fans of techno-pop phenomenon Perfume, the trio who have reigned as Japan’s biggest girlband for some 15 years – and who are crash-landing their sold-out stadium show into Kakegawa that same evening. Outside the stadium, the atmosphere is somewhere between the excitement of a football match and the hushed reverence of the Vatican. A low but perceptible hum of intense fandom vibrates around the arena. Impromptu tribute acts to the band are dotted around, like a slightly-off amuse bouche before the main course. Middle-aged people and teenagers alike buzz around tents, purchasing CDs and merchandise (as Aya, their rep and sometime-translator, explains later on, the fanbase is diverse, with older guys who remember the band in their ‘Teen Idol’ idoru days, and new, Gen Z fans who admire Perfume as the strong, feminist front they are today). Some of the t-shirts are only purchasable by members of the PTA – in translation, that’s the ‘Perfume Official Fanclub’, not the Parent-Teacher Association – heightening the cultish feel further. Inside, ornate flower arrangements brighten the concrete entrance hall, the kind you normally only see at funerals – in fact, I’m told, these are sent to the band at every concert by other J-Pop bands, to wish them good luck on the night. There’s no alcohol served here: just the pure high of witnessing a Perfume concert. Perfume are a phenomenon for their staying power alone. Appropriately for their futuristic sound, they were formed at the turn of the millenium, but hit the true major leagues when they left their Y2K ‘teen idol’ phase behind in favour of a supercharged, electric vision that could reflect the new, culturally openera Japan found itself in. In the show, the lights come up on a kind of hyperspeed timeline of the band’s history, the date flickering through the 2000s to now and lightspeed years into the future (see the opening to the “Future Pop” video for a sense). When we meet after the concert, the band’s acceleration feels unstoppable: they’re in the middle of their seventh world tour, with their seventh album, Future Pop, having debuted at number four on Billboard’s Global Top 100 (trailing only K-Pop behemoth BTS, and the Crazy Rich Asians soundtrack). But they’re also in more of a reflective mode than the techno-futuristic aesthetic would suggest: on the video for their ultra-catchy earworm “Let Me Know”, A-Chan, Nocchi and Kashiyuka travel on board a phantom bus straight out of Studio Ghibli, as childhood versions of themselves thoughtfully look on. In person, the three women of Perfume are guarded but sweet, epitomised by the personal, freshly prepared dessert selection backstage They drink sugary looking drinks from straws, but they look fresh, hardly like they’ve been dancing in heels for over two hours. A-Chan is clearly the spokesperson, speaking the most; Nocchi is the cool one, in baggy Mom jeans and her own merch t-shirt; Kashiyuka is the most watchful, with a mature vibe. They seem at their ease, and chat to me after the interview is done about various idiosyncratic topics: where my liquid eyeliner is from (Rimmel), and whether Laura Ashley still a thing in the UK. Like K-Pop, much is made in foreign media of the manufactured nature of J-Pop, and the men behind the music: Future Pop’s songs are again the brainchild of the band’s longtime collaborator and mega-producer Yasutaka Nakata. But behind the android-like visuals, and as the women behind Perfume turn 30 this year, they are being revealed little by little – just in time for Western audiences to get to know them better. In 2019, the genius techno-pop sound of bands like Perfume continues to find new fans globally. In Britain and the US, digital-saturated viewers are craving the kind of bold futurism such concerts can offer, with their spectacle that that can be experienced IRL, at almost-touching distance. At time of writing in January, Perfume have been announced on Coachella’s Sunday line-up, on the same billing as Ariana Grande, Khalid, and Bad Bunny. Watch out, Ariana: when it comes to Perfume, it doesn’t matter whether you’re in sleepy Kakegawa or a polo field in the Californian desert, every Perfume show is like Super Bowl Sunday. In 2039. The technology in the show is completely mind-blowing, like nothing I’d seen before. I wondered, was there a technological innovation this tour that you were most excited about? 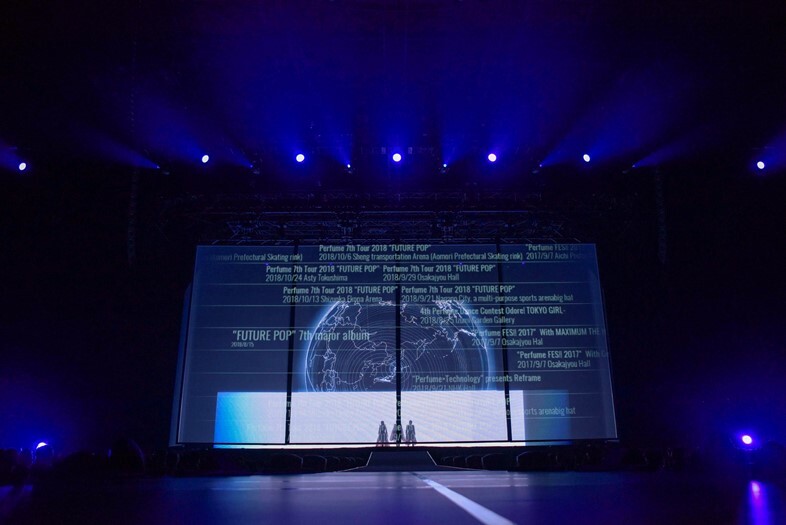 A-Chan: The biggest one is the silhouette on the screen, the one for the song called “Fusion”. I don’t even know what to call that technology (laughter) – but basically the big silhouette on screen, matching our movements dancing in front. It matched what we were doing. There’s currently such a fear around technology, with anxieties around AI, data protection and machine learning… I wondered if part of Future Pop is this idea of having fun with technology again? A-Chan: In a way, yes! People seem to try to experience technology through Perfume. With things like the new upcoming 5G connection we can connect to the world, (so) everybody can experience the same thing simultaneously around the world. (To me), that is like the future world – and that’s the theme of the music video on “Future Pop”, the song. 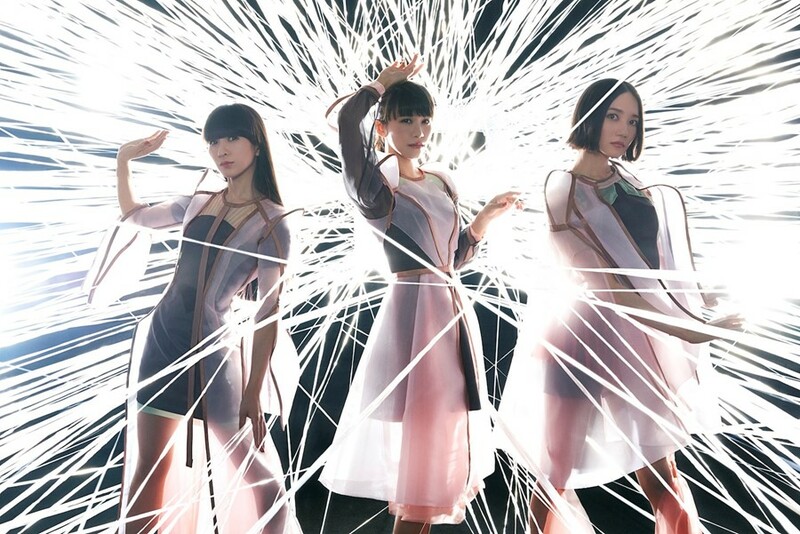 People do see Perfume as sort of like the future of pop, but at the same time, you saw the show – there are songs like “Tenku” (“Sky”), where the lyrics are like, “I might be small, but I want to have big wings, to fly high someday”. So there is the technology side to it, but there are also some parts which are very warm and human. You’ve obviously been performing for such a long time – I can’t even imagine how many shows you must have done by now. What do you do to stop yourself from being too nervous before you go on stage? Kashiyuka: If we say to each other that we’re nervous, we make ourselves more nervous! So we try to fool around until right before the show, just to kind of forget about the nervousness. What do you think someone who’s uninitiated in Perfume should listen to first? What’s a good way to get into your world? Nocchi: Tough question! (laughs) It’s not on this record, but there’s the song called “Spending All My Time”, and on the music video we’re dancing in a very boring room, very controlled, without any facial expression... that’s kind of like the image people tend to have for us at first, so that might be a good starting point. But do you think that’s developed since then into something different? It’s kind of impersonal and not giving too much of yourselves away – do you feel like now you’re trying to reveal more of yourselves? A-chan: The android vibe is actually still part of us. But what you see in live shows are a little bit more human. People are starting to see different aspects of us throughout the years, and by doing that we have set their expectations of us higher and higher – (it’s through) that, that we’ve been growing since then, too. Who is someone you admire the most? Nocchi: Mikiko was (our) first dance teacher and we’re still together after 18 years – we still admire her, from like day one. Her dreams are our dreams! But she’s also very down to earth and very, very charming in person. Whose face do you think should be the 10,000 yen note? Kashiyuka: Ryunosuke Kamiki – he’s a very good looking, young actor. We belong to the same management. (We’ve) known him since we were very young but now he’s in his twenties, but he’s still like an angel. What’s the strangest gift a fan ever gave you? Sounds utterly terrifying. What’s your favourite Japanese movie? It reminds me of Studio Ghibli around here, actually. Is there something about yourself that might surprise people if they knew about you? Like a strange habit or something. Nocchi: Not many people know that my hair is always sprayed hard to stay down! It’s like, really really stiff. Unless I do that the inside of my hair gets caught on my lashes which is why I have to make it really stiff. I didn’t actually realise until today’s show how stiff my hair is (laughs). It really doesn’t move on stage, which is crazy. What do you like to do when you have a break from touring? Apart from sleep. A-Chan: We actually get together and do stuff like play boardgames. We like to go to Escape Rooms. You can actually play some of the Escape Rooms in English too, here. We like it because we understand so much about each other (already), and it’s so emotional! Like how we manage to solve the riddle, it’s like a miracle (has) happened… we don’t need to talk to understand each other. So you like it because you’re good at it? All: (laughs) We're good in different ways, in different genres – so it’s a team effort.